Smoothie season is in full swing! While the weather hasn’t really been warm lately we’re enjoying all the sunshine filled days we can. Smoothie or smoothie bowls we’ll take them all, especially when the temps rise. Breakfast, lunch, dinner, snack, or dessert we’ll eat them anytime of day. 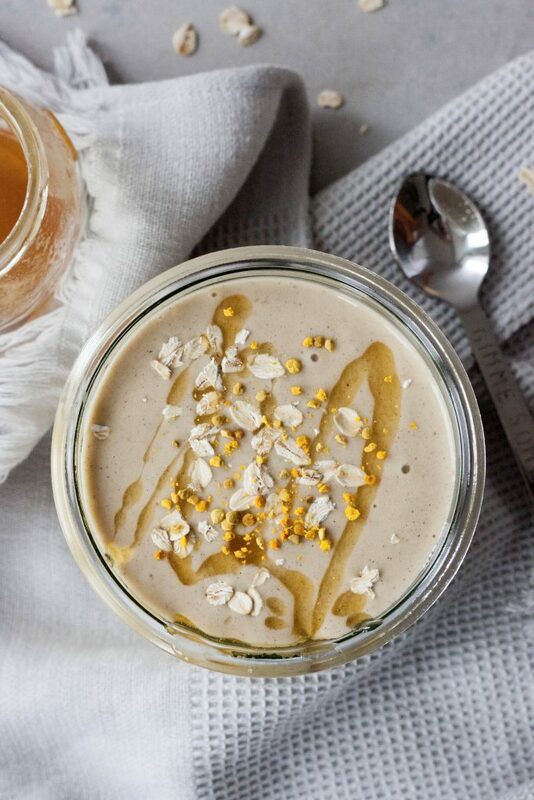 This Honey Nana Oat Smoothie or Smoothie Bowl is a simple one that hits that sweet spot any and every time! Sometimes the simple basic combos are best and this basic one is one I’m loving lately. 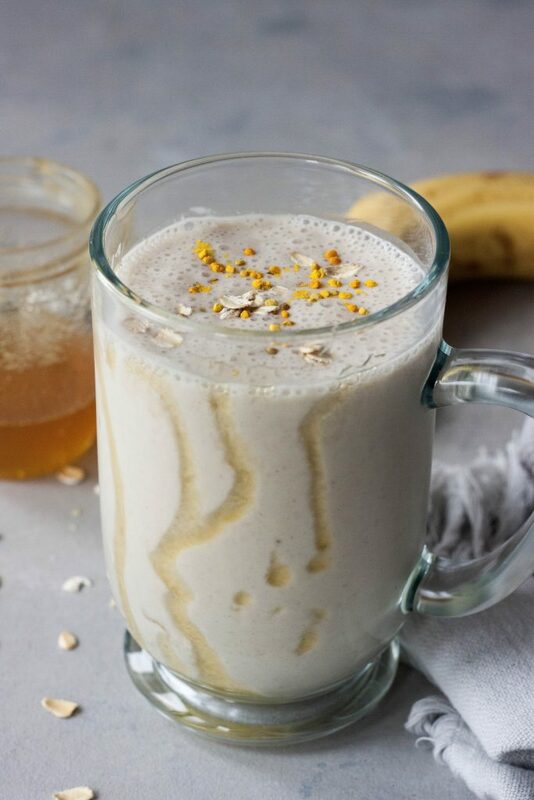 It can be made as a protein smoothie or a simple and indulging whole foods smoothie using homemade nut milk or a cold pressed thicker nut milk. I like to also add in a couple superfoods as needed like maca and Ashwagana but leave those out of the girls smoothies. Allergies also in full swing and for additional nutrition I like to use local honey and sprinkle with bee pollen. Oats really help thicken the smoothie and make it a great way to start the day as a breakfast smoothie or perfect for an afternoon pre soccer fueling smoothie for the girls. With the indulging simple sweetness of honey it’s a real treat. When not making a coffee and banana smoothie for breakfast before barre this is my go-to smoothie lately. With oats, bananas, and honey for energy and additional protein and or homemade nut milk for protein is great before or after my workouts. Depending on when I’m making it I also sneak in some maca and ashwaganda into mine as it doesn’t change the taste and those are adaptagens “superfoods” I’m taking daily right now. Honey has long been used for it’s antibacterial and anti-inflammatory properties. Local honey is often used for allergies. People often consume bee pollen for it’s nutrition, to improve stamina and or athletic performance, to reduce inflammation, and for allergies. My favorite reason for using local honey is the simple sweet taste and adding in local bee pollen for nutritional benefits (vitamins and minerals) and I love it’s bright color. When enjoying honey I’m brought back to our days in Ireland and the local honey and honey treats there. Sometimes you just can’t beat the classic basics. 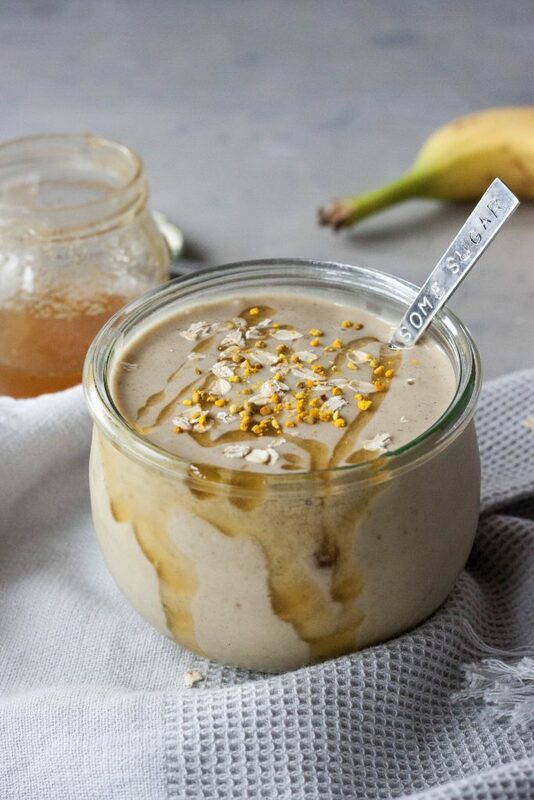 This Honey Nana Oat Smoothie and Smoothie Bowl are one that will transport you to a state of relaxation and comfort. I love enjoying this one slowly and it’s especially sweet enjoyed outside soaking up sunshine. *Thicker milk, such as homemade especially if not using protein powder. 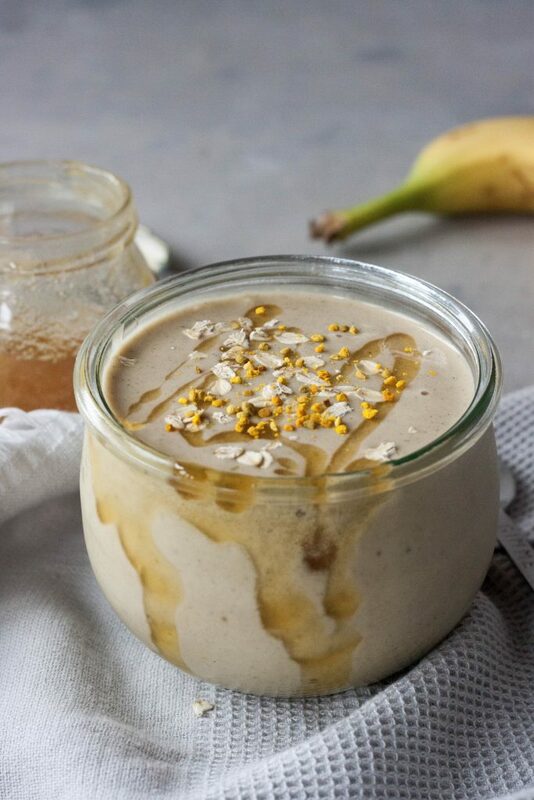 If not using protein powder you will also need more banana to make a smoothie bowl. Just 1 banana for smoothie. In a Vitamix, or high-speed blender, blend milk, oats, honey and optional protein and superfoods until smooth. Add in 1 banana and blend, adding in more banana in as needed and using the tamper tool until desired consistency is reached. For a smoothie I add in 1 banana and closer to 2 for a smoothie bowl. 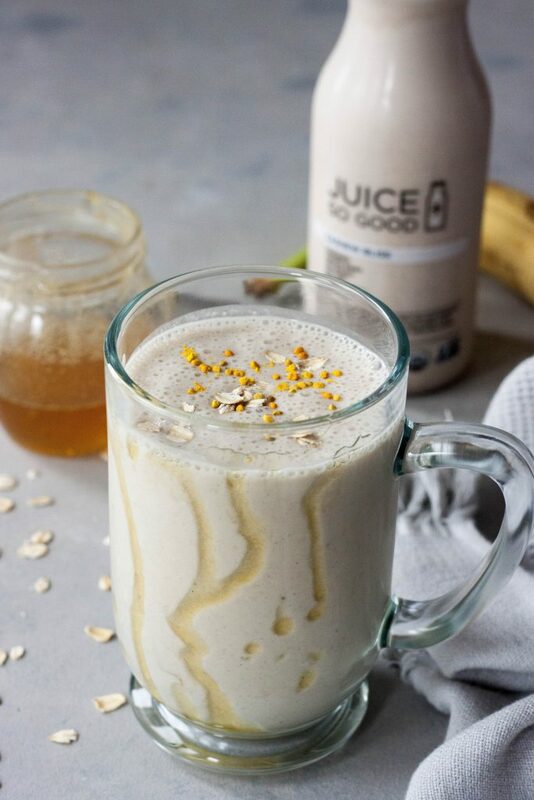 Drizzle glass or top of smoothie with optional honey and bee pollen. Enjoy! Love the oats and honey combo!